The 34th Annual Saint Valentine’s Day Luncheon & Fashion Show presented by NorthPark Center and Nancy C. and Richard R. Rogers and Melody and Rick Rogers was a smashing success. 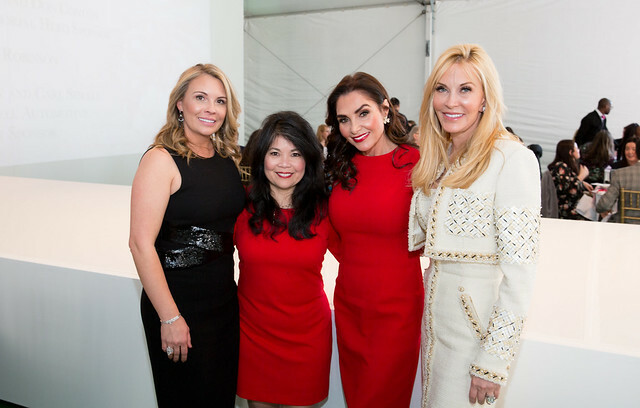 Lead by chairs Rozalyn Columbo and Nancy Gopez, the event surpassed its budget of $630,000 (and counting 💰) to benefit The Leukemia & Lymphoma Society (LLS). This was the first year the legendary luncheon was held at CenterPark Garden at NorthPark Mall under a large clear tent. Jan Strimple effortlessly coordinated dozens of models who showcased the spring looks from some of NorthPark Mall’s top designer stores. Fox4 anchor Clarice Tinsley served as the emcee as she welcomed the patrons and introduced the honorees. The Memorial Hero award sponsored by Robyn and Don Conlin was presented to Kimberly Alexander on behalf of her late husband, Elijah Alexander, who fought a valiant battle against multiple myeloma. Mona Carlton Stogner and Greg Stogner received the Lynda Adleta Heart of Gold award for their steadfast dedication to the LLS-led Beat AML initiative in honor of Mona’s brother, Olan. And 7-year-old Kaitlyn Johnson took home the Spirit of Tom Landry Character Award after fighting cancer twice and eventually beating it with LLS-funded groundbreaking CAR-T therapy. Nancy A. Nasher was the Honorary Chair and Heather Perttula Randall served as the Advisory Chair. Kudos to the Luncheon chairs who created a strong leadership team for the 2018 event: Underwriting Chairs – Carmaleta Whiteley Felton and Kim Hext; Table Sales Chairs – Maggie Kipp and Mary Parker Raffle; Chairs – Jenna Alexander and Andrea Nayfa; Design & Décor Chair – Cathy Kincaid; Board Chair – Don Armstrong; and North Texas Executive Director – Patricia Thomson. To learn more, visit www.lls.org/ntx.